ALTHOUGH much has been written about Edinburgh Castle, the historical interest attaching to the ancient fortress is so great that perhaps the appearance of another book on the part it played in the romantic history of Scotland is not without justification. This attempt to collect the strands of history from the web wherein the story of the Castle is woven was not undertaken with any intention of writing a ‘guide-book. My desire has been to entertain those who dwell within the shadows of the grey fortress and to give to others who may visit its ancient battlements food for the inspiration which from my earliest days I have received from them. I have pleasure in expressing my indebtedness to, among present-day authorities, Mr. C. G. Cash, F.R.S.G.S., and Mr. John Geddie; also to the monumental work edited by the late Rev. Dr. Taylor. My thanks are due to my friend Professor Patrick Geddes, who has kindly furnished the book with an Introduction, and to Mr. William J. Hay, who read the proofs with much care. IT must be twenty years and more since Mr. Weirter and I made acquaintance; when he joined the cheerful company and helped the opening festival of one of those groups of students, happily mingled with artists, who in hostel after hostel of Castlehill and Lawnmarket and St. Giles were in those days initiating for Edinburgh the adoption of that free and informal mode of associated life from which the historic colleges of mediaeval universities have been a further but not always a more vital development. And I speak here first of this little fellowship of University Hall, not only as having afforded our initial and enduring personal tie, but as having set its stamp upon us both, since common environment and associated action ever tend toward unity of interest and harmony of spirit. For our association of 'town and gown'—of individual citizen and student then, and as yet, but planned to steep and spread into University and City in no very distant morrow—was already foreseeing, in this union of artist and student, the educational future, in which the old schism between knowledge and beauty, the long separation of learning and art, and of these from the common life, shall be abated. More than this, it was also forefeeling an opening civic future, through which our romantic old town, largely fallen though it has been for generations into squalor and even ruin, should yet be worthily conserved, maintained, renewed. From our vantage-points among its highest outlooks we could already foresee its recovered precedence over the New Town, which with all its stateliness is, and can be, but the foremost mansion-suburb of the historic city. To the rightful denizens of this—the innumerable company of lawyers made perfect, who well-nigh to a man, as fame has so long made known, and social survey can but confirm, exceed those of all other cities in scrupulous conformities, in conscious respectabilities, and all the other formal virtues, and whose dynamic attitude, that of criticism, is correspondingly practised and displayed—to these, I say, our dreams have naturally appeared but vain, as indeed they do to this day, and even to most of those fathers of either City or University who mistakenly persist in inhabiting that dangerously chilling neighbourhood. Still, our fraternity has managed to survive j and as little by little we have cleansed and gardened,, repaired and built, our dreams have developed* our plans and town-plans with them, until we are well-nigh ready to leave to our successors in these first hostels of Old Edinburgh not merely the project, but a clear and organized, albeit plastic and adaptive, design for the * Historic Mile/ nothing short of the phoenix-like renewal of the ancient capital as a modern one. With this too may advance that rejuvenescence of its University, which has long and at many points been in unmistakable if tardy progress, as henceforth largely a residential one, yet withal not less democratic than in its best days, with its modest halls and courts mingled among the homes and gardens of the people; and it may be, yet more vitally and closely knit with their own renewing purpose and joy of life than even were the friaries of old, or are the settlements of to-day. Thus, even within the opening generation Old Edinburgh may again be no less significant than in its bygone days of patriotic defence or of religious initiative, of political intensity or of philosophic thought. Indeed, why not more than ever? For what if that rarest of historic marvels, that of a city’s too rare culture-blossoming and architectural renewal, be after all a simple and an opening life-secret—that which lies plain before us in the growing child, the interaction of bodily and mental life, of health and happiness as sound and sane—material conditions and higher activities evolving together? Even for the academic town, though Edinburgh, past or future, is far more, our associated endeavours from the very first have begun to show how it may readily, even speedily, be made a no insignificant nor less iniividual third to those two most magnificent of the material creations of collegiate life in the past, the *Backs’ in Cambridge, the 'High’ of Oxford. For, unapproachably splendid in their way though these two monumental perspectives be, here is a yet fuller civic, national, and historic seat, in the most nobly romantic and inspiring setting; and this for learning and its professions, and up to their highest applications and expressions in literature or for art; and with its innumerable study windows, befitting a city of thought, each commanding some synthetic yet changeful view and vision of city and country, mountain and sea and sky, hardly surpassed by that which of old aided the thought of Athens to its encyclopaedic syntheses, which stirred it to creative idealisms. Where better can youth recall the long pageant of the historic past, and thence proceed to grapple with the tangled tasks of the present, or search into its problems, and finally plan and strive toward the opening future, than upon this long sky-line which runs from the Abbey ruins and the Palace towers up to the yet more varied and historic Castle, and which thus sums up against the sky the past, the present, and something of the opening future; and all this scarce less dramatically and far more comprehensively than in any other great city^view in the world? For in the high outlooks of the classic cities so full a presentment of recent and present times is lacking, while from the towering heights of new^world centres we miss the rich perspective of the past. Here, moreover, the presentment is complete and emphatic enough to be more than a local record; and to be broadly representative, and to a scarcely less striking degree, of the main institutions and monuments of the long history of civilization. It is no less than this social and civic completeness which gives the central panorama of Edinburgh its impressiveness to every eye. Scott's work was indeed above all an evidence of this and an earnest of more: and thus, when that tragic pre-eminence in the diseases of overcrowding amid which the University has so justly won and ever and again renews her medical fame has been cleansed away for good, and her most crowded school thus falls to mere provincial magnitude, she may bestir herself to the shaping of a new Faculty of Civics, with a School of Sociology perhaps no less pre-eminent in its turn. Here then, and indeed more fully stated than either of us has realized before, are the deep ties which after so many years have brought our artist^author and his preface writer together—fitly at first as players in one of the masques with which we have been celebrating the semi-jubilee of our pro*collegiate and civic endeavour ; and now, fitly again, between these bookish beards, as lovers of Old Edinburgh, and each therefore in his own way intimate with its initial, central, culminating feature, the rock-built Castle. Edinburgh, though fruitful in young ability and aspiration and rich in educative resource and influence, has ever been one of the sternest mothers; chary of claiming, even accepting, her children’s aid, but sending them forth throughout the world to seek what fortune may send. Yet few can forget her charm, and many at one phase or another of life “return with a natural and salmon like affection to the place of their rearing. And these feel more than before the simple pride and pleasure of their youth in her antique stones, since now their very dust is felt to lie deep with memories dear. Here then is an essential cause of this book, and the spirit of its drawings and its tales together. To set forth the old, heroic Heritage of the past, to recognize mingled with this the sombre Burden, is an ever-renewing task of the arts : the harper and saga-man of old, the minstrel and the ballad-singer, the romancer and historian, and now the etcher and writer of today are in one true and continuous succession. 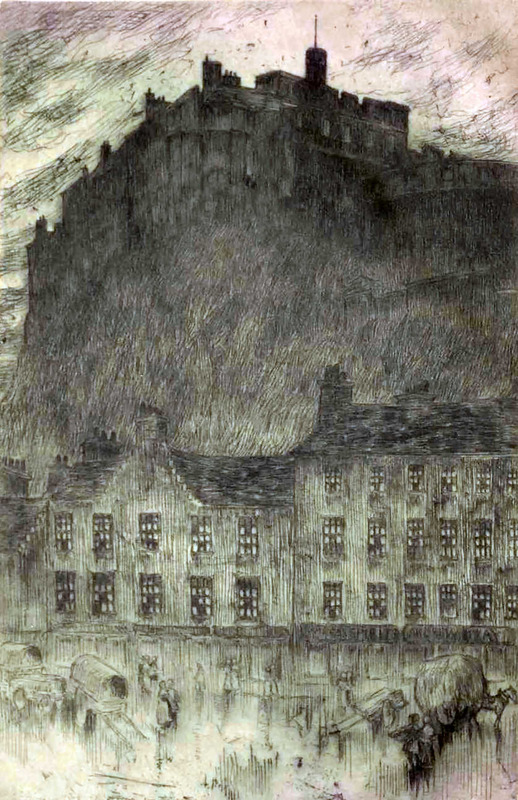 It may seem long since Sir Walter first adequately revealed Edinburgh and its region to Scotland and the world; and since then, after the memorable generation he kindled again to Cavalier and to Puritan idealisms, we have had that long reaction into a coalition of the defects of both, from which we are again seeking escape. Till two generations ago and less the name of Scot has stood throughout the world with and for the noblest—witness, at simplest, the proverbial phrases of France not only Fiev comme ten Ecossais, or even Hospitalier comme vcn Ecossais, but also, and this through history most truly of all, Genereux comme un. Ecossais for who have ever held friendship and honour more high, and life more lightly? But to-day, wherever English is spoken, have not the commonest associations of 'Scotch' come to be but with drink and with bawbees? Nor are these undeserved; these vile thirsts and obsessions in which we thus are acclaimed by our imitators to xiv excel are at once the essence and the nemesis of the coalition aforesaid, that of old mysticisms decayed with ambitions degraded. And our city would not be that well-nigh perfect expression of Scottish and of general history and civilization as which we have claimed it d!d it not to-day stamp itself upon every eye by its long lines of public-houses and slums, by the perhaps yet more ominously towering first-class hotels which confront them, and above all by a bank and an advertisement office upon the fullest level of magnificence, in fact the only two nobly situated buildings of our time upon which wealth has been poured out like water. But now again the times are changing, and we with them. The generation which will be remembered in history as most identified with the material growth of towns, but these debased with dull prosperity and drugged into squalid sleep, is now lapsing from its ill-used power, and a new age of Cities is beginning. Is this not plain to the reader? Not yet plain in Edinburgh or in London it may be confessed, though indications are not lacking; yet here, where I am writing, it is plain to every citizen, and even manifesting itself before every child. For this old city of Ghent is on fete—a city to many seeming now merely provincial, and of course a long way outside Brussels, yet none the less the most historic and monumental of all the regional capitals of the longest civilized and most civilizing region of Northern Europe, this great delta of the Netherlands, of which the 'Great Powers' are still in too many ways but the lagging hinterlands or the outlying isles. This main fete of Ghent is a world-exhibition, and that in many ways of the best; above all to be remembered beyond its material wonders, as of radiology, aviation and the rest, for having given the clearest expression in the world as yet of a conception long and slowly struggling toward utterance at many points in England and America alike, and not least in Edinburgh—and now soon to be familiar throughout the world as a new objective for thought, a new goal for policy—that of the Revival of Cities. For here in one palace, worthily metropolitan, are shown forth the civic services of Paris, after seeing which the purest of political fools will not so readily again sneer Gas and Sewage. Then near this a noble 'Square Communal is formed by the palaces of the four greatest cities of the land, Ghent, Antwerp, Brussels, Liege. The nearest doorway to this square is that of the most varied and many-sided of Civic and Town Planning Exhibitions as yet brought together ; and beside it has just met the 'First International Congress of Cities' with representation from a hundred and more all the way from Aberdeen to Bucharest, at which the burger master and councillor and engineer have sat in unwonted converse with the historian, the idealist, and the artist. Almost as I write an hour-long tercentenary pageant has marched and ridden by, to the unveiling of a great monument to the city’s worthies of yet earlier centuries, the brothers Van Eyck; and from this the young King has gone on to open the garden fetes, and to encourage the new agricultural village. And so on: the Revivance of Cities is in actual progress; and here, if any still doubt, we have a kilometre and more of plan-covered walls to confirm it; though of course how long our Rip Van Winkles may snore, or, if awakened, feel puzzled or determinedly incredulous, is a quite different matter. Enough, however, of Ghent for the present; it is time to come home to Edinburgh, where with all its beauty the seasons are late and it is chilly in the morning. Pending the approaching Revivance of Edinburgh, what better task than to be thus recording its central monument and heritage with Mr. Weirter, to be interpreting its broadest aspects with Dr. Schlapp, to be redesigning its pageant of memories, as Mr. Orr in his turn is doing ? In such ways artists, writers, and readers have come together before now; and, when the time is but a little more ripe, we too may join hands in the coming Masque of Arousal.